BRC features Mayoral candidates Adolpho Carrion, Jr. and Tom Allon. In February’s meeting we met two news-making candidates for in-depth introductions to their campaigns. Having the floor in separate hours, they graciously offered ample time for Q & As– communicating on a level that resonated with most attendees. After beginning by voicing support for LICH and introducing other local issues, BRC president Joe Nardiello introduced Mr. Carrion in the first hour, saying he’s the only candidate seeking the Republican nomination that has already won elections. 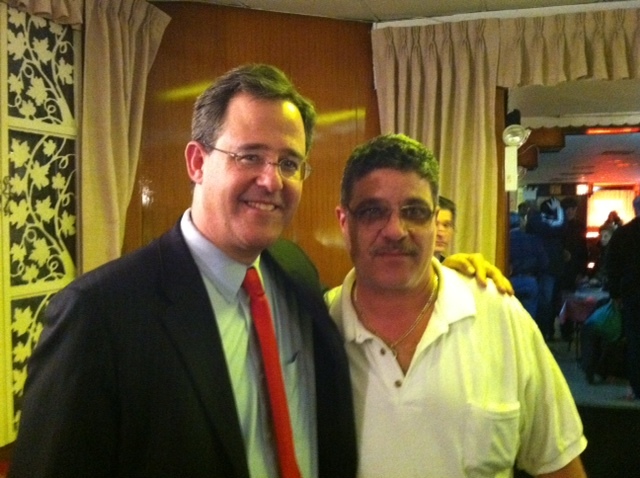 The former Bronx Borough President and City Councilman has the support of Kings County GOP leadership and that of the Bronx. Mr. Carrion communicated strategies for winning as he highlighted his significant resume for seeking the Office. He has the nomination of the Independence Party and emphasized his independent run as symbolic of being apart of the Democratic Party’s special interests. Beginning his public service as Director for a Bronx Community Board, Mr. Carrion recounted how he answered the needs of his areas from the grassroots, upward. Cleaner, safer streets and Education he said were common threads that he’d work to improve across all of New York City. He said there has to be a greater understanding of Police procedure, and that “Stop, Question and Frisk” frequently loses the word “question” with the media. Mr. Carrion emphasized that NYC is failing our kids, judging by the numbers of inner-city students that are not ready for college and higher education. He recounted his opposition to proposals by the Giuliani Administration for a small program of school vouchers, saying that the City needs bigger more comprehensive answers. 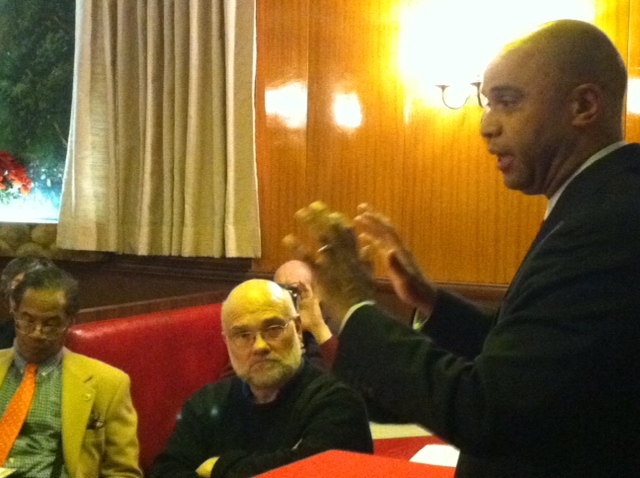 He spoke of the City’s diversity, covered his background as a pastor and experience in business. Working alongside the Giuliani administration as Bronx Borough President, he helped guide development/retention of the Hunts Point Market, the new Yankee Stadium as well as over thousands of units of low/moderate income housing. Mr. Carrion also has a national perspective, serving as President Obama’s Secretary of Urban Affairs for two years, and later added the experience of HUD’s New York region (Housing and Urban Development). The 25 attendees had many questions for Mr. Carrion. 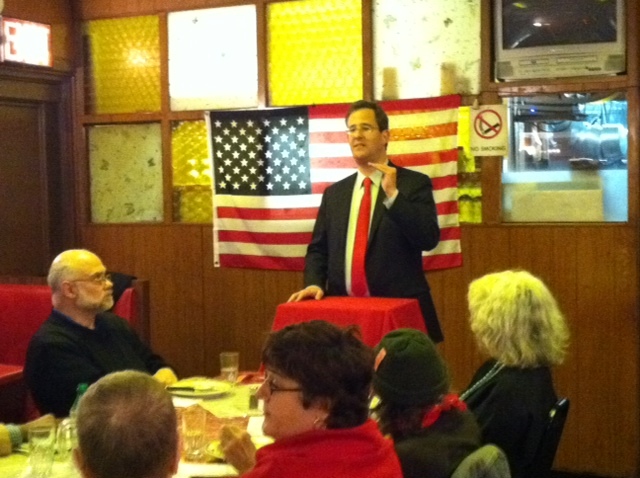 One gentleman asked how he could be a better presumptive leader of the NYC Republican Party – than the last few Republican Mayors. Mr. Carrion answered that participation is a 2-way process and compared/contrasted his experience with both Mayor Bloomberg and many of the Democratic field. In the second hour, it was Republican Tom Allon’s floor. Tom Allon immediately said he’s a Republican that can win a general election, and recommended that all Republicans in NYC should set aside the social-issues that play nationally vs. GOP candidates. Mr. Allon knows first-hand of the immigrant experience as the son of parents that had escaped the Holocaust. Raised in Manhattan, Mr. Allon began as a teacher in Stuyvesant HS and credited discussions and mentoring from author Frank McCourt (who taught at Stuyvesant at the time) to encourage his talent for writing and journalism. Years later, Mr. Allon was the person who talked Mayor Ed Koch to begin contributing unabashed movie reviews. Earlier that day, Mr. Allon had done live radio with NPR’s Brian Lehrer (click to listen) and an interview with the NY Post. Mr. Allon briefly gave an overview of his family, but opted more to use his time to introduce a series of ideas. His process for improving education was well received by 2-3 retired teachers attending (one, later playfully pointed out the differences between teaching in Stuyvesant and Eramus Hall, in Brooklyn). Essentially, he wants to reform the process/profession of teaching by training on the level of how doctors are rehearsed, long before they practice. “After all, teachers are operating with our children each day.” He wants to cut through the unions and emphasis that protects teachers and a system, over tackling the systemic issues at hand — considering student graduation, aptitudes, and attitude for what they draw from education. To get more revenues into the school system, he proposes selling the air rights above schools to private investors — in order to renovate far more school buildings with private sector funds. Mr. Allon is an advocate for economic and job development, and for continuing what’s working with the City’s approaches vs. crime. However, he offered improvements for example how Mr. Allon feels newest NYPD shouldn’t be sent to the most challenged areas, because they have the least amount of training. When his performance in the aforementioned Housing/Mayoral forum was raised, he recalled how upon listening to the Democrats’ rants vs. NYCHA’s Commissioner and misappropriation of funds/repair schedules, etc., he called for all candidates to join him that very next day in demanding his resignation from Mayor Bloomberg. They were silent. He spoke of how he’d want to approach the many unions with contracts due for negotiation, in response to a question that evoked the first years of Mayor Lindsey. When he was asked to define his toughness, overall…he gave one of his most memorable lines of the evening. “I’ve been in Board Rooms with some of the toughest businessman that NYC has seen. Put it this way, I am Israel. I’m peaceful, and intelligent dialogue is of the utmost importance. But cross me or attack, and I won’t hold back and level where you live.” Delivered calmly, it added a perspective that made attendees (later on) take notice and comment that he would be stronger on union contracts and give/take than they believed earlier. At times, BRC meetings exceed anyone’s expectations. The candor of both candidates, and openness to answer any question (in detail and length) – left many with a great feeling about what’s to unfold in the Mayoral primary and race ahead. The SUNY board of trustees voted unanimously Friday morning to close Long Island College Hospital. The decision to pull the plug on LICH followed a contentious public hearing late Thursday in Midtown Manhattan at which SUNY was derided for not making a sincere effort to save the Cobble Hill medical center. The Midtown Manhattan meeting room where the trustees voted Friday was filled with LICH supporters who shouted “Shame! Shame!” when the vote was done. Long Island College Hospital reportedly on brink – activists, nurses, doctors, community responds to avert its closing. Short of a local version of Paul Revere riding down Atlantic Avenue — our local hospital may need a real hero. Here are events to get involved right away (further down this page). It’s certainly not looking like our Mayor Bloomberg or Gov. Cuomo (who is much closer to this issue, respective of LICH being under CUNY Downstate’s management), nor our Public Advocate, whatever it is he does.. will be engaged on the matter. 52nd Assemblywoman Joan Millman (D) and Borough President Marty Markowitz are impressively leading the charge.. but despite local outcry there’s not many others beside them — yet. It will come down to our community (meaning, you an us). The NY Daily News has gone bare-knuckles, publishing the high-end salaries of the SUNY directors. For nearly two weeks, our community has voiced a strong and unified defense in support of LICH — after reports of pending decisions to close and sell Brooklyn’s longtime an vital medical institution. 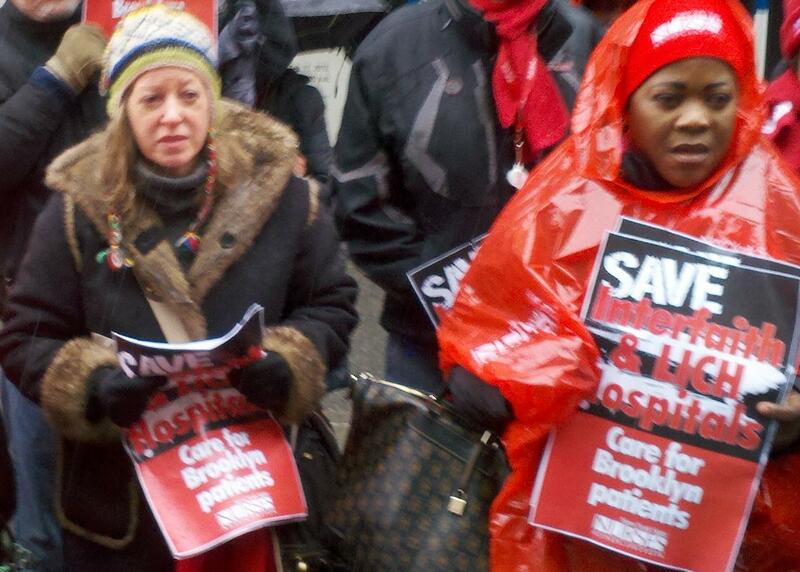 Nurses and doctors have organized, and led supporters to reach out to Gov. Cuomo for help and review. Under questionable and frustrating management with Continuum for years (which sold off many of its properties in Cobble Hill/Atlantic Avenue) and despite being incorporated into the SUNY Downstate system in order to ‘save‘ LICH from its seemingly self-destructive prior leadership — SUNY may be looking for a large, lump-sum payday. By selling off the actual buildings — SUNY may be seeing the dollar-signs, over the impact, history and necessity of LICH. Beyond employing nearly 1,900 people, beyond its active Emergency room, and service to 100,000s of residents Downtown and across 7-8 densely populated neighborhoods (including Brooklyn Heights, Gowanus, Carroll Gardens, and the waterfront from Red Hook, Columbia Heights, around to Williamsburg).. SUNY may make this terrible decision, within days. Discussions with LICH officials reveal that the hospital is actually economically sustainable on its own — but carries $100s of millions of debt saddled and associated with decisions of its prior and current management. During our last meeting, we urged members to phone Gov. Cuomo (who is oddly still AWOL from publicly commenting or pledging to review, mediate or analyze decisions of SUNY Downstate). Now, a Cobble Hill resident has send the following urgent email through the local web-ring of the Carroll Gardens Neighborhood Association (CGNA). It is a communication from the Kane Street Synagogue, and demonstrates just how many organizations throughout our areas are working, quickly to engage the public to react and reach out. Help Save Long Island College Hospital – Today! The Long Island College Hospital (LICH) is a vital community institution. It has been in our area for 150 years, employs 1900 people, and most importantly provides life-saving services to people in our area from DUMBO to Red Hook. There were 122,300 patient visits to LICH in 2012; 25,900 of those were visits to the ER. 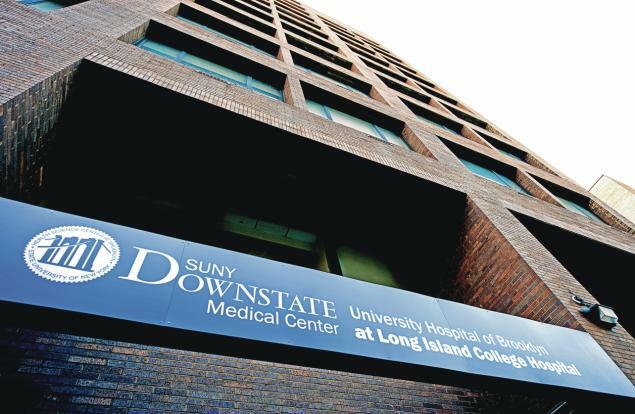 The Board of Trustees of the State University of New York (SUNY), which owns LICH is expected to propose at its meeting this Friday that the hospital be closed. By law, there has to be a “Public Meeting/ Hearing” to get this process started. The hearing will take place TODAY, Thursday, February 7, from 3:00-5:00 P.M. at the Auditorium of the College of Optometry, 33 West 42nd Street in Manhattan. Call Governor Cuomo at 518 474 8390 and tell him that our community needs this hospital. Attend the hearing tomorrow at 33 W. 42nd Street. Your physical presence is a statement of support. Attend a Rally for LICH on Friday, February 8 at LICH, at 8:30 A.M. followed by aHall march to Borough Hall where there will be a press conference at 9:30 A.M and a public hearing at 10:30 A.M.
You can also show your concern by attending a community forum about LICH next Thursday, February 14, from 6-8 P.M. at the synagogue (236 Kane St). The forum is sponsored by the Cobble Hill Association, Brooklyn Heights Association, Carroll Garden Association, Kane Street Synagogue, New York State Nurses Association, and 1199 SEIU. Instantly recognizable worldwide, Hizzoner had a NY style that was a throwback to the Bronx of early last century — and it was authentic. Mayor Koch was the very fabric of the City. Even at 88 years old he was active across today’s politics. Frequent guest on NY-1′s news analysis, he was always honest and open, and willing to speak his mind as you’d expect from a New Yorker. From his start in politics, be battled and beat Tammany Hall in Manhattan’s Greenwich Village — served NYC as a Congressman, then “Mayor for life”. He won his 3rd term with 75% of the vote, before an ill-fated run at Governor and scandals in Queens/Bronx affected him. They weren’t his doing, but it weighed on him and revealed the depth of his caring. In the video linked, he admits to a deep depression – and how NY’s Cardinal O’Connor helped significantly, by phoning him and reassuring NYC’s love and support with (words used as the headline of this posting). Mayor Koch did all he could, and usually with a sense of humor — even, writing movie reviews (which were always a fun read) . They don’t make them like this, anymore. Millions of us, wish they did.